Fate is one of the mystical forces in our universe that escapes all explanation and is only visible to us through the lens of hindsight. Each day, we wander mindlessly as we suffer through the routine doldrums in the office, at school, in a car, on the train, or on the couch, never quite knowing when fate will move us to achieve greater things in the grand scheme of the cosmos. While we can surely never predict when these unseen forces will strike next, it is impossible to mistake the precise moment our path intersects the threads of existence that profoundly shape our lives, only to be explained by our feeble, mortal minds as destiny. This past weekend, I found myself under a fading amber sky speckled with a few of the brighter stars in our galaxy when I recognized the planets had aligned in my favor. 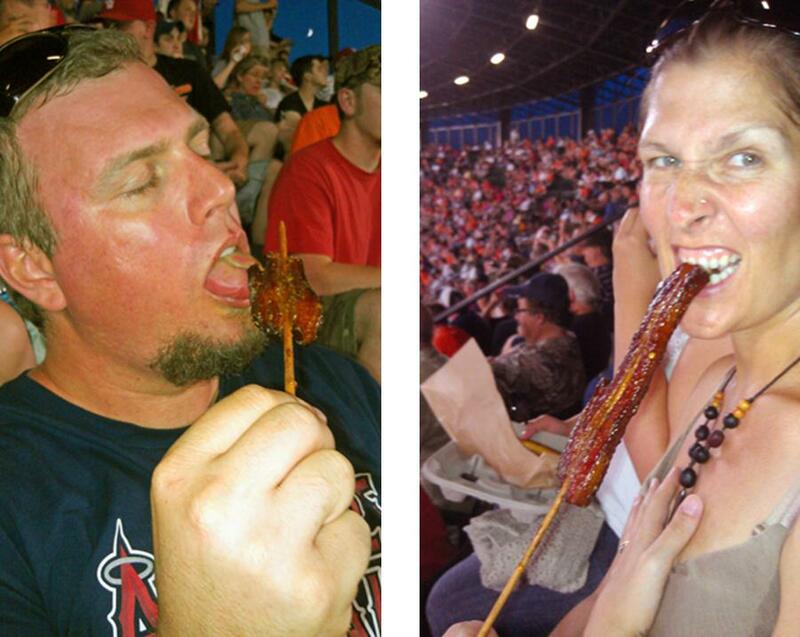 It happened as I was standing in line for the Holy Grail of ballpark food: bacon…on…a…stick. How is this fate, you ask? I admit, I have been actively plotting my march upon Baltimore to uncover this treasure at Oriole Park at Camden Yards ever since I discovered this rare gem of stadium fare mentioned in the Washington Post. I also stumbled through an earlier blog post about it, pausing continuously to dab the drool off the keyboard. What made this a date with destiny was that this outing was never planned or even thought out leading up to this moment. I was in Baltimore with my wife to meet our friends and feed my insatiable appetite for food served from a truck at the Baltimore-Washington Food Truck Competition (which was fantastic, by the way). Oddly enough (or is it? 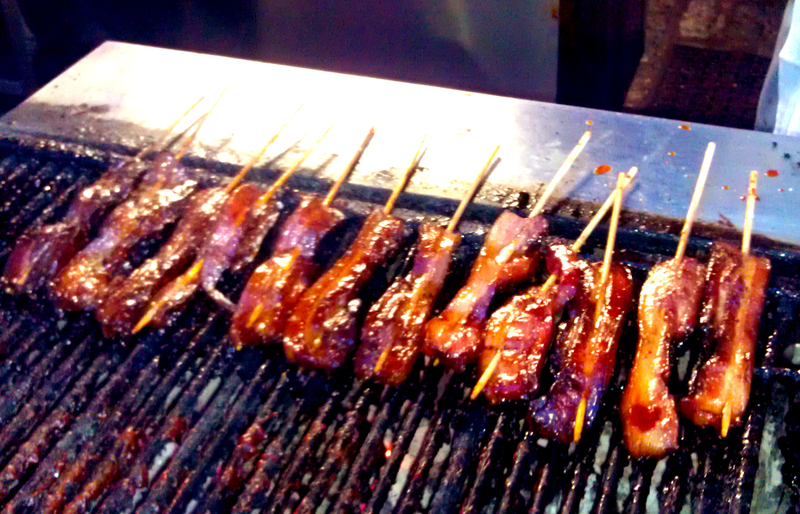 ), the idea to go watch the Baltimore Orioles face the Washington Nationals that evening surfaced as my buddy and I indulged in the signature item of the D.C.-based food truck, Stix: tender pieces of bacon-wrapped filet mignon…served on a stick! With both baseball teams sitting at or near the top of the standings in their respective divisions, it was sure to be a tough ticket to score. However, the ebb and flow of cosmic waves was too strong and, coupled with my shrewd bargaining skills, produced four tickets for nearly face value at the sold-out event. Shortly after settling into our seats, I realized it was time to take fate into my own hands. Making our way to Eutaw Street, my friend and I finally arrived at the long line of other people who, like me, were magnetically drawn to the power of bacon on a stick. Behold, bacon on a stick, brought to you by the Jack Daniel’s Grill at Camden Yards. So How Good Was It? It is really difficult to explain just how amazing bacon on a stick tastes. First, it’s marinated in a honey-hickory barbecue sauce before it ever hits the grill. The flames bring out the inherently smoky flavor in the bacon, which is generously sliced at about ½ inch—the fattest piece of bacon I have ever witnessed. The combination of the briny pork and the sweet honey glaze is truly blissful, offering the eater a perfect marriage of salt and sugar that can only be described as a match made in hog heaven. Upon eating, my mouth and teeth became coated with the sticky-sweet glaze and bacon bits, similar to the way Sugar Daddy suckers get caught in your teeth, allowing me to savor the delight for at least 15 minutes after “finishing” my treat. It was so good, in fact, that my lovely wife–who, at one point in her life, was nearly vegetarian–was prompted to steal the bacon directly from my hands and take the first bite. On the right, my lovely wife cautiously bites into the bacon on a stick while bracing for a potential heart attack, which she averted with ease. On the left, I get hot and heavy with my bacon, fully embracing any additional twists of fate in the form of coronary heart failure so long as I can taste the sweet meat one last time. While I may have had it grossly wrong by predicting sudden onset heart attacks from eating bacon on a stick, I knew my premonition of finding heaven on earth would hold true. In fact, I am going to Baltimore this evening, where, as destiny would have it, the Los Angeles Angels are in town and…I will eat more bacon on a stick. My advice to anybody that has yet to sample this delicacy is simple: do not wait for fate. 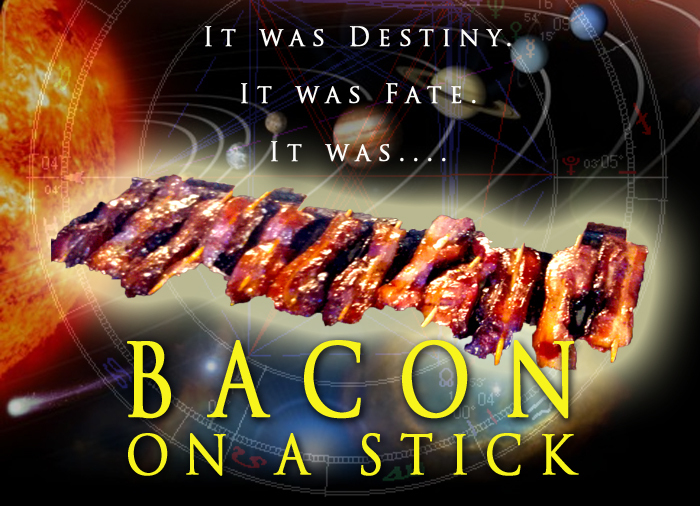 Fulfill your own destiny and eat bacon on a stick today. This entry was posted in Lifestyle and tagged bacon, Baltimore, Camden, food, Orioles, stadium, stick by Troy Beckman. Bookmark the permalink. I’m working on a television show and would be interested in one of your pictures above. Feel free to email me (juliette@sharpentertainment.com) so we can talk about it!